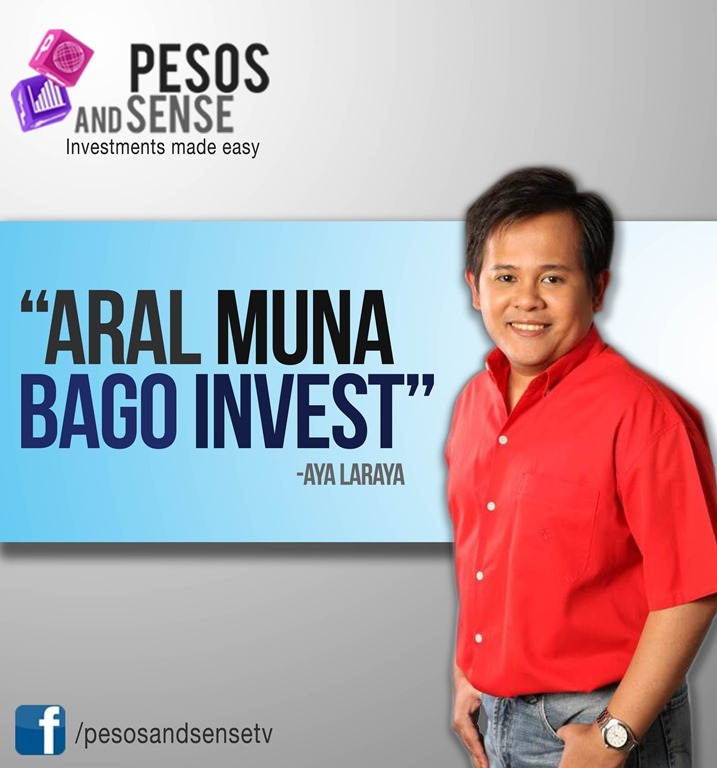 As the below poster from Pesos and Sense goes: “Aral muna bago invest” – Aya Laraya. Indeed, before entering into any investment, financial or otherwise, study your options first. In the news for weeks now, we hear about thousands of investors in Visayas and Mindanao duped by Aman Futures Group, Visioner 20/20, and The Rasuman Group. These separate groups have all promised the same thing: get-rich-quick, guaranteeing 30%-60% return rate in a short period of time. Every few years, we see these stories in the news. The faces change, the names change, but the tactics are all the same. Why then do our countrymen still fall prey to these scammers? Before October closed I attended Module 2 of the Pesos and Sense Seminar Series: Time Value of Money. I attended the first module (Make your money grow) months ago and have made initial investments since then. In this installment, I learned about key things one should take into consideration when deciding on a suitable investment. One of these is FUTURE VALUE – how much do you want to get in the future out of your investment? Now in scam situations, the promised future value is usually very high, 30% to 70% of the initial investment. What’s more is that this is supposedly recoverable within a short amount of time, say a year. So are claims like this automatically scams in nature? If they are unable to tell you exactly where the profit is coming from, where the money is going to be invested, then you need to start asking more questions. If it’s too good to be true, then maybe it is too good to be true. Even PNoy offered his tips on avoiding pyramid scams. How much do I invest and how much will I get? These are very simple questions, but the answers are very important. In summary, it pays to be educated. Here, educated doesn’t mean formal schooling or a University degree. Financial literacy is key. Do not go into something without first learning about it. For this information (and more), driving to Commonwealth on a Saturday afternoon was well worth it. I had almost missed the seminar because my day was so full (Friday night shift > Monday morning therapy > Seminar in the afternoon > Saturday night shift) but I didn’t want to throw away the free pass that the Pesos and Sense team gave me for being a loyal stalker of their projects. And Sir Aya and team did not disappoint. There was new information, and I learned a lot from the very active audience. Compared to the first seminar I attended, there were more questions from the floor this time. There was even a long line after the session because some participants chose to field their questions privately. The Pesos and Sense Seminar Series is something I would continue to recommend to anyone wanting to know more about growing their money. They have raised registration prices a bit, but just consider it as your initial investment for your future. Filipinos are very social. Sikolohiyang Pilipino (Filipino Psychology) identifies kapwa/pakikipagkapwa as our core value. This refers to community, togetherness. We hardly do things alone. Oh we do, but things make much more sense if we do them with others, or if the end result is for others. That’s probably why Facebook is so popular in this country. They say 9 out of 10 Pinoys have a Facebook account. Not sure how accurate that is, I can’t find exact and accurate figures. FB allows us to keep tabs on our family and friends. Though we don’t even bother to text or call them offline, we can show our seeming concern over their affairs and well-being online. People I haven’t talked to or seen in 10 years are ‘speaking’ to me online. But being social has its toll. When you see your friends posting photos of their latest gadgets, or photos of their recent getaways, you can’t help but WANT those things too. If you have a job, then you probably can afford it. But do you want to spend on those really? It’s true, deciding where to use your money can be a tough call. What are your priorities? What do you want for yourself? Do I buy that electric guitar now and live my rockstar dream (even if just at home), or do I wait a few months or years? Am I good with my four pairs of shoes, or do I really need a red pair for that outfit I might wear at least once this year? But the video also kinda makes it sound so boring. Can’t wise investors ever have fun? Can’t we have the good things in life right now as well? I think we can. It’s really just all a matter of planning. This hot Saturday afternoon, I broke routine and did something I don’t normally do: attend a seminar that promised to help me MAKE MY MONEY GROW. Oh the idea of growing my money! Last year, I got to read Bo Sanchez’ very short but totally eye-opening book: My Maid Invests in the Stock Market… And Why You Should Too! So I’ve been thinking about investing in stocks, but months later, here I am probably poorer than the day I read it. Thinking about it isn’t the same thing as doing it. Then sometime this year, I caught a rerun of a Pesos and Sense episode. I liked their Facebook page after the show, but again, it didn’t take me any step closer to investing. A few weeks back, I saw the above image on the Pesos and Sense Facebook page. Minutes later, I filled out the registration form. I paid the PhP 495 fee on Tuesday. I attended the seminar earlier this afternoon. Am I any closer to investing? I’d have to say YES. The seminar was held at the premises of Citisec Online, a brokerage company, at the Philippine Stock Exchange Building. At the back of the room, there were sign up forms, which were quickly snatched up by attendees. I didn’t get a single one. No biggie, they’re available online. Citisec is also the company mentioned by Bo Sanchez in his book. The presenter, Aya Laraya, is also affiliated with the company. But this seminar isn’t specifically about investing in the stock market. Other investment options were discussed as well. What the presenter tried to do was give us basic information to help us decide where to invest. Before he did that, he of course made a quite convincing case for why it is wise to invest your money NOW, and why yesterday was the best time to do it. Am I any richer for attending the seminar? Hmm richer in knowledge YES. But I think I could have skipped this seminar altogether, only because I am already convinced that I should invest in stocks. I do recommend this seminar to those who need more info, or even those who are not yet decided on what is the right investment for them. Would I attend other seminars? If it was more specific to investing in stocks, then yes I would! And they are cooking up more seminars, this is the just the first in a series. For COL, Aya Laraya also holds seminars twice a week.